Like many dishes with disputed origins that date back to past centuries, steak tartare recipes have many variations. The preparation methods, preferred condiments and flavorings may differ, as well as the type of meat used. The only constant in the legends surrounding steak tartare recipes is that the main ingredient is meat. The meat is traditionally served raw, although one Mexican version marinates it to doneness and a Belgian variation calls for cooking the meat. 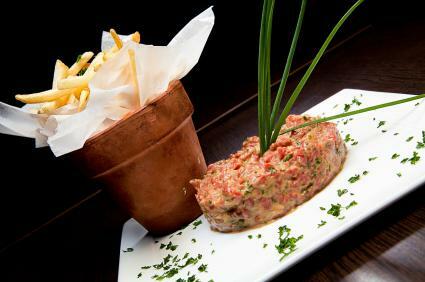 The name tartare comes from the nomadic Tartare tribes that roamed Central Asia in the fifth century. They allegedly had no time to cook their food and placed raw meat under their saddles to tenderize it and eat it on the run. Though it is unclear how the dish made it from the fifth century into contemporary French cuisine, it first turned up on menus in French restaurant around the turn of the 20th century. Dubbed steak a l'Americaine, its description in the famous cookbook Larousse Gastronomique's 1938 edition was raw ground beef mixed with a raw egg yolk. As the recipe grew in popularity, different chefs and countries added their own spices and garnishes to distinguish their versions from others. The most popular variations incorporated onions, capers, Worcestershire sauce and/or raw eggs into the recipe. This copycat recipe is a version of the steak tartare served for decades at the posh Polo Lounge in the Beverly Hills Hotel. In a non-metal bowl, mix and mash the anchovies, capers and mustard with a fork or spoon until well combined. Mix in the egg yolks until well incorporated with the other ingredients. Gently fold the remaining ingredients into the egg mixture until well mixed. Season to taste with coarsely ground salt and freshly ground black pepper. Serve garnished with parsley sprigs, with French fries or toast points on the side. This version is appropriate as a first course or appetizer. The beef is ground more finely than in the original version. Thoroughly combine the beef with the remaining ingredients. Form the meat into an attractive patty or loaf on a decorative ceramic or glass dish. Cover the dish with foil or plastic wrap and let the flavors marry in the refrigerator for about a half hour. Surround with crackers or toast rounds on which to spread the tartare. Diners frequently shun steak tartare because eating raw meat is unusual or diners fear ill health effects from its consumption. High quality beef generally poses no health risks and once you taste the delicate flavor of steak tartare, it may become a favorite treat to prepare at home.